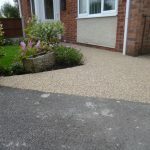 Concrete tired old, cracked and unattractive, this family wanted to protect further the deteriorating surface. 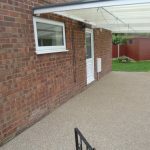 At the same time they wanted a more decorative and attractive entrance to the property. 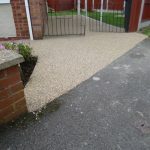 Now in a day this North East Derbyshire resin aggregate resurfacing project was completed. 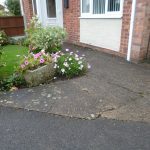 The concrete surface had been down a number of years. 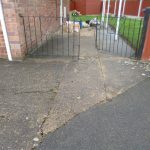 Evidence showing in these images. 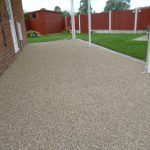 Surface prepped prior to application of the resin with minimal mess and no skip required. 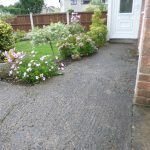 Anti slip and weed free. 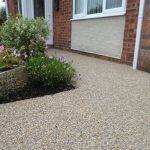 Edge detail along the length of the side of the property gives this a nice finish to the resin bonded stone. 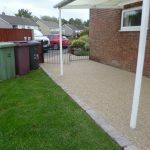 From where we are based in the East Midlands (the Derbyshire and Nottinghamshire border) we can resurface your driveway path or patio. 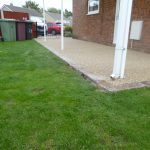 Providing you with a weed free and anti slip alternative to the usual block paving, imprinted concrete, tarmac, and concrete options. 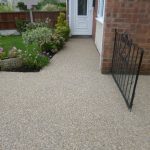 Beeston, Bolsover, Clowne, Daventry, Edwinstowe, Gedling, Kirkby in Ashfield, Loughborough, Matlock, Newthorpe, Old Whittington, Radcliffe on Trent, Sheffield, Walesby, Weston Coyney, Wollaton or Clay Cross. 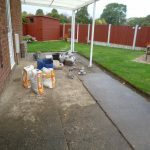 This entry was posted on Sunday, September 23rd, 2018 at 7:41 am	and is filed under Concrete, Diary of a Mansfield Resin Driveway Company, Driveways, gardens, Imprinted Concrete, Latest News, Mansfield, Paths, Patios, Tarmac and Asphalt. You can follow any responses to this entry through the RSS 2.0 feed. Both comments and pings are currently closed.